Hurrah! Finally a lunchbox that isn’t just salad! As much as I champion salads for lunch as they’re a great way of of having a decent portion and packing in loads of different ingredients and flavours without overeating, I was beginning to run out of ideas that weren’t basically the same or just slight variations on other salads I’d already featured on here. I’m not a fan of sandwiches for lunch, too much bread just makes me feel bloated and sluggish for the rest of the day and soup isn’t that appealing when the weather’s starting to warm up, so I went shopping at the weekend and bought myself some wraps. 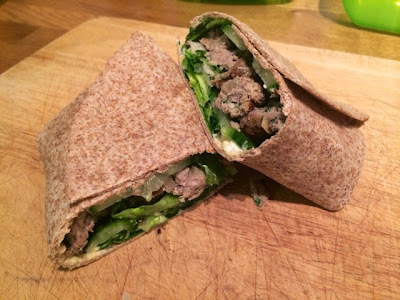 I’ve always been a big fan of wraps, they’re pretty versatile and great for wrapping up any dinner leftovers and turning them into a healthy lunch. 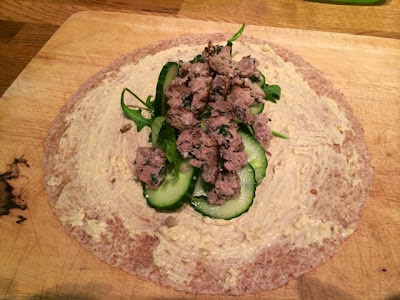 I’ve gone for wholemeal tortilla wraps to be a bit healthier, you can get some great whole grain ones too which are really tasty. In this case, I had some leftover lamb koftas from the weekend which I thought would make a great wrap filling. I crumbled up a couple and filled the wrap out with salad. I always spread the tortillas with something as it helps them hold their shape when folded as well as adding a bit of extra flavour. 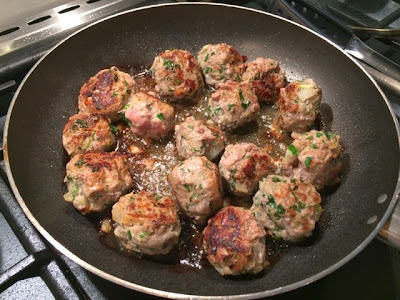 Usually I use some cream cheese or mayo but I thought I’d stick with the Mediterranean theme of the koftas and used hummus instead this time, this was a genius idea, I’ll definitely be using it again.